Sadoh, Godwin. 2017. “Intercultural Elements in the Organ Works of Fela Sowande.” Diapason 108, no. 3: 23-25. The article profiles composer and performer Fela Sowande. He was raised in the Nigerian bicultural topography where the English cultural values and the Yoruba traditional culture co-existed. He arrived in the U.S. at the peak of civil rights activities, African American renaissance and Afro-centric idealism in the 1960s. 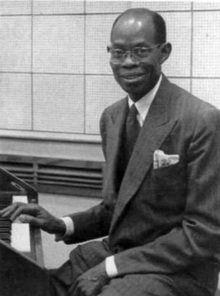 The contribution of Sowande to the ideologies include how he borrowed African-American spirituals and integrated them into his music compositions.